Wild, dangerous, and flat-out unbelievable, here is the incredible memoir of the Canadian actor, gambler, and raconteur, and one of the greatest stand-up comedians of all time. As this book’s title suggests, Norm Macdonald tells the story of his life—more or less—from his origins on a farm in the backwoods of Ontario and an epically disastrous appearance on Star Search to his account of auditioning for Lorne Michaels and his memorable run as the anchor of Weekend Update on Saturday Night Live—until he was fired because a corporate executive didn’t think he was funny. 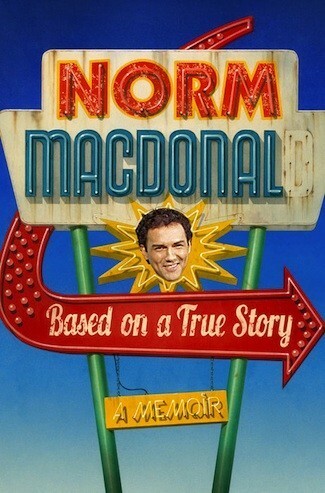 But Based on a True Story is much more than just a memoir; it’s the hilarious, inspired epic of Norm’s life. In dispatches from a road trip to Las Vegas (part of a plan hatched to regain the fortune he’d lost to sports betting and other vices) with his sidekick and enabler, Adam Eget, Norm recounts the milestone moments, the regrets, the love affairs, the times fortune smiled on his life, and the times it refused to smile. As the clock ticks down, Norm’s debt reaches record heights, and he must find a way to evade the hefty price that’s been placed on his head by one of the most dangerous loan sharks in the country. As a comedy legend should, Norm peppers these pages with classic jokes and long-mythologized Hollywood stories. 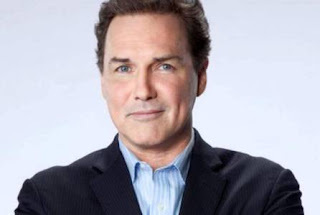 This wildly adventurous, totally original, and absurdly funny saga turns the conventional “comic’s memoir” on its head and gives the reader an exclusive pass inside the mad, glorious mind of Norm Macdonald. I think I just read it with this book. Seriously. Did he have a ghost writer, or did he not? I don't know. It was weird, expectantly, but was it too weird? I did laugh. A lot, in fact. I was also baffled at times too. Still, I enjoyed what I read. This guy comes from a place in Ontario that I haven't even heard of, and I live in Ontario too. I found that funny, but it also prompts me to want to see more of my beautiful province. Do I feel like I read a memoir? Not in the least. Even when he discussed actually events in his career, they all drifted to something else all together and somehow it all became about Adam. So did I love it? Not really. I didn't dislike it either. It just was.... well, I don't know what it was, but it was. **No compensation was received for posting. Compensation will be earned if purchases are made from the links within. An ecopy was provided via NetGalley to facilitate a review. Opinions are owned by Freda's Voice. I would definitely read this book as I like memoirs and comic memoirs are very welcome. Your review is entertaining. Hmm, those are some interesting comments about the book, but I think in general, it sounds like it would be amusing! I'm not familiar with the author, but the book sounds like one I'd enjoy. I kind of feel used. I want to think this book is good but it really isn't. While I can't say it is plagiarized, the writing structure and verbiage is not unfamiliar. The funny devices are meant to shock but really seem cheap. Basically, he and his writer aimed at getting in enough word count to meet publisher requirements. Maybe norm isn't brilliant. Maybe norm just says odd things in an interesting voice. It's garbage. Not even fun.